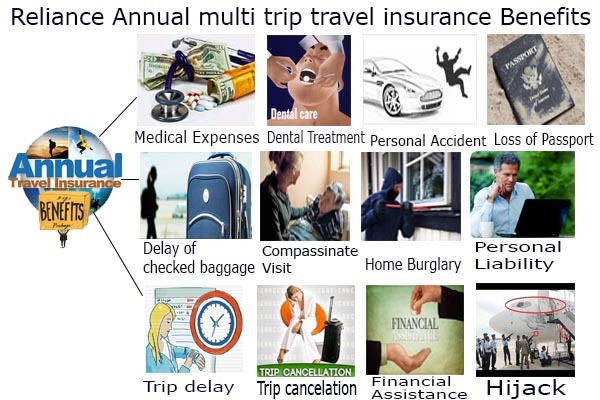 annual multi trip travel insurance is a type of insurance that provides you medical, financial and other assistance in case of any emergency while traveling outside the country . Reliance annual multi trip travel insurance specially designed for the people who you are a frequent flyer, then getting insurance for every overseas journey that you make can get tedious. Reliance Travel Care Policy- Annual Multi Trip Plan is specially designed for frequent international travelers, which provides a comprehensive travel package for your trips across the year. Annual multi trip travel insurance plan ensures some features and more through its extensive covers and benefits so that Annual multi trip travel insurance policy can be adequately protected you at all times. If you travel quite often, then it is always advisable to buy an annual multi trip travel cover for all your yearly trips than buying a single travel insurance for every trip.As a frequent traveler you might not be unaware of missed flights, cancelled trips. Therefore, make it a point that your multi trip travel insurance policy covers you for such situations.Annual multi trip travel insurance -reliance annual travel cover helps to you avoid those situations. Annual multi trip travel insurance policy is a Comprehensive and Custom Made coverage through various unique benefits like Compassionate Visit, Home Burglary Insurance, Financial Emergency Assistance etc. Annual multi trip travel insurance gives you the maximum coverage with minimal paperwork. Annual multi trip travel insurance plan provides an automated extensions of policy in case certain eventualities. realiance general insurance offer compensation for liability/damages paid to a third party, resulting from death, injury or damage to health or property that is caused involuntarily by you or your family member abroad. Andheri (E), Mumbai – 400093, India. Annual Multi Travel insurance has a premium calculator used to calculate the premium of the policy. However to enjoy a hassle free trip, it is recommendable that you take a travel insurance policy even if you are traveling to countries apart from these. 3.Can I buy insurance if I am going on a work permit abroad? A.Reliance General Insurance has a special policy called the Pravasi Bhartiya Yojana Policy, covering individuals travelling under a work permit. 4.Can the existing International travel policy be extended to cover domestic travel as well? A.An international policy is not extendable for domestic travel. Any medical or accident policy that you may have, will cover your for the relevant benefits while you are travelling within the country. 5.What if a Hand Bag is lost while travelling by airline, will it be covered? A.The loss of handbag is not covered. The Policy pays or reimburses only for a delay in transportation of checked-in baggage accepted by a common carrier by which you/ insured would be traveling. It is also mandatory that the common carrier has issued a baggage receipt for the trip.